How Can You Prevent Dehydration of Your Dog? A dog that is dehydrated will try to seek out water to drink. A dog may appear to be restless and pace while they look for water. Most dogs will also repeatedly lick their lips and seem anxious. If the dog has a water bowl that is empty it will sometimes lay next to or rest they nose on the water bowl. Your dog's behavior can be one of the first indication that they are in need of more water so it is best to pay attention to how they act. One of the at-home test you can perform to tell if your dog is dehydrated is to test the scruff of your dog or the skin that is right at the back of your dog's neck. When you gently raise this skin it should fall back into place quickly. If your dog is dehydrated, it will take longer for this skin to return since dehydration causes the skin to lose elasticity. An early sign of dehydration is dry gums that feel tacky. A well-hydrated dog will have shiny and moist gums. Keep in mind that frightened or anxious dogs will also have these signs of dehydration in dogs. If your dog is not urinating as much as it regularly would or if the urine is dark yellow in color, this is a common sign of dehydration. Dogs will urinate less because their bladder is empty or will have dark yellow urine if the bladder is working hard to recycle the fluids the body does have. Dogs that are kept outdoors most of the time are at higher risk of dehydration both in the hot and cold weather. During the summer, dogs can become dehydrated because of the heat; in the winter, dogs can become dehydrated when their water supply freezes. Dogs who also have systemic diseases, which often cause a loss of appetite, vomiting, and diarrhea, will become dehydrated more quickly than other dogs. Smaller dogs can become dehydrated more easily as well as older dogs. Pregnant dogs or dogs that are nursing are at an increased risk of becoming dehydrated as well as dogs that suffer from certain illnesses. 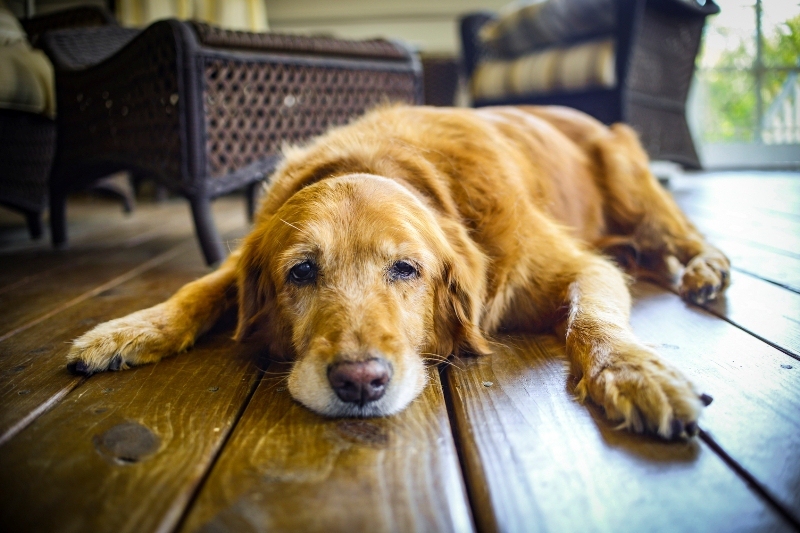 Dogs that are diabetic, have cancer, kidney disorder or ones with an infectious disease should all be carefully monitored for signs of dehydration in dogs. How much water a dog needs to drink will vary depending on the size and breed of the dogs as well as any health conditions it may have. As a general rule, dogs should drink around 55 ml of water for every kilogram of their body weight or 1 ounce for every pound, a day. Ensure your dog has clean water throughout the day. Keep dog water bowls cleaned to prevent bacteria from growing which can cause a dog to not drink enough water. Monitor how much water your dog drinks during the days, especially if they have been ill, vomiting or have had diarrhea recently. Use a weighted water bowl to prevent your dog from accidentally knocking it over. Always carry extra water with your when traveling with your dog or when out exercising with them. Check your dog's mouth for injury such as sores or for foreign objects like sticks if you notice your dog is not drinking as much as they normally would. Do not leave your dog chained outside where he can become easily tangled and unable to reach his water bowl. If you notice any signs of dehydration in dogs, call the veterinarian for assistance. Server responsed at: 04/25/2019 4:19 p.m.